Just for Shuggy kicks, here’s another recently discovered vintage log to thrown on the holy fire that is Auburn’s persecution complex–a snapshot of southern sports media bias as it existed in 1975: A disembodied Shug floats above a byline for a story on his final season written by a guy probably related to his successor, while Bear Bryant, before just a regular ol’ season, and in all his iconic glory, fills the entire cover of a football magazine that apparently allowed him to write his own articles. Bear’s boys lost their season opener against Missouri (hang your houndstooth in shame!) but went the rest of the way undefeated. 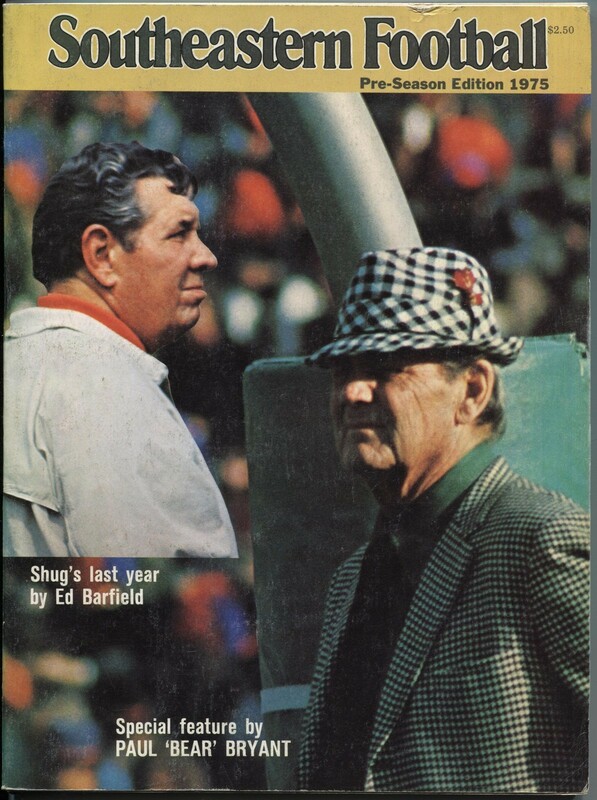 Shug’s final year as the face of Auburn football was a pockmarked 3-6-2. His last meeting with Bear? A 28-0 loss. But from pain came pleasure.